Looking for a tasty surprise for your kiddos lunchbox that won't send them into sugar overload? Then look no further than Mrs. Thinster's CookieThins. CookieThins are a thin and crispy cookie that are made with wholesome ingredients. They are non-GMO, and made with no corn syrup, artificial flavors, colors, or preservatives. It's a lunchbox surprise that you can treat the kids with and not feel guilty. They come in a handy resealable bag so you don't have to worry about them going stale either before they are all eaten. That is if they last that long. Once my kids got a taste of them they were running back for more. Heck my daughter had shared hers with a friend at school then came home asking for more because her friend liked them so much. As a mom I feel good about giving these to my kid as a fun surprise. And of course enjoying some for myself every now and then too! CookieThins are available in Brownie Batter, Chocolate Chip, Cake Batter, and Toasted Coconut. We only use simple, wholesome ingredients that you have in your pantry, crafted in a facility that does not process peanuts or tree nuts. We pride ourselves on making cookies that are thin, crispy and deliciously crunchy. With three great flavors…Mrs. 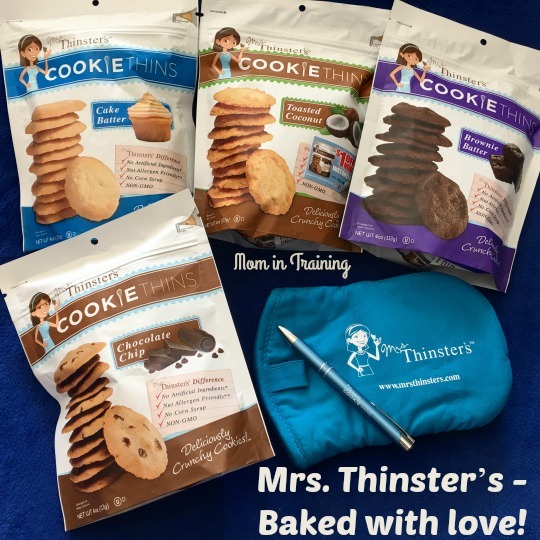 Thinster’s cookie thins are always baked with love.